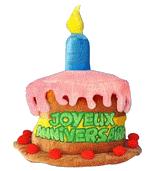 The aldweb site is 10 years old!!! On February 11th, 2009, my web site had been online for 10 years. . Lack of free time did not allow me to refresh it a little bit before today, but the day has come to celebrate these 10 years. First visible effect of this event is that I finally took the time to migrate my web site to the latest version of the GuppY web portal which, let's remember..., was born here January 1st, 2003 but was named miniPortail at the time, and I have put a brand new site skin (thanks to Papinou for his huge help in providing me this relooking). As a consequence, I invite you to answer to the new poll to tell me what you think of it, the previous poll (the 6th one) having given a nice and friendly result. Would you like to see how my web site evolved over these 10 years, then give a look to the Old stories page. I also updated the yearly visits statistics and I am very happy to know that almost 1300 people come to my web site every day. During the last 2 years, we could see Apple's iPhone climb on top of the smartphone economy, we could also see some first Google Android smartphones get on the market, while Microsoft tried to keep up with their whatever they call it mobile OS... and Palm declining day after day! However, after almost 2 years without an update (but I was keeping on coding on my Palm Tungsten C), I put on line a new major version of iziBasic, as well as a new versions of ViziBasic and NekoCat, which benefit from the number of enhancements that were developed in iziBasic. 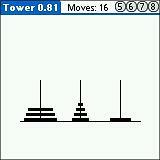 Martin ported to Palm the well-known programming exercise of the Towers of Hanoi to iziBasic. You may want to download this implementation on his dedicated web page http://izibasic.aldweb.com/martin/. I was very recently very surprised to discover a brand new Palm on-board Basic compiler being actively developed. 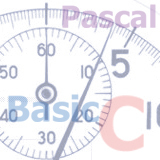 So, almost three years after I last updated my Palm Development Tools Benchmark page, I decided to see how this new FastBasic real on-board compiler (which is, by the way, very close in terms of design and language syntax to my own iziBasic...) would compare to the other Palm development tools. And, you will see that its name was well chosen. Lou Incorvati offers in freeware his Palm applications, Stop Or Go (my prefered game, I play it about every day...) and Catan Dice Deck which were written with iziBasic, now hosted on a brand new web page: http://izibasic.aldweb.com/lou/. Michael Winikoff has written and maintained during many years a web page which was very well-known by Palm developers: PalmPilot Software Development - Alternatives to C. This is the ultimate reference of a listing of all development tools available for the Palm OS platform. Michael Winikoff decided to stop maintaining this page and he kindly offered me to host it. One year after the last major update for this software, here is a new update for SysInfo, which enhances one more time (SysInfo is updated since 2001 on a regular basis), this "Swiss knife" system tool for the Palm OS equiped PDAs. Release of Speedy version 7.1, the reference benchmark tool for Palm devices since 2001. Were added the benchmark value for the Palm Centro, for the GSL Xplore M28 and M70. I also added the benchmark value for a Palm Tungsten C running with a maximum overclocking, it must be difficult to get a faster Palm device to date! I also updated the Devices Benchmark page which lists all Speedy results for a huge number of the Palm devices. Release of Speedy version 7.0, the reference benchmark tool for Palm devices since 2001. Were added the benchmark value for the Palm Treo 755p and also for the HTC S710 which is a device operating under Windows Mobile for Smartphone (yes, Speedy is emulated like a charm under the StyleTap platform on Windows Mobile devices, it is therefore now possible to analyze the relative speed of a Palm application running in such an environment). As announced in my previous news, a new version for all my free applications developped with iziBasic was put online. This is a good opportunity to play again with the now classic among Palm applications that NekoCat, Matches, Numerus, iBClock and tinyBasic are, or to discover the nice head ache that iHeadAche is! Today's other great news is that, after years waiting for it, even doubting it was real, Sébastien Furic sent me the source code of his ANS Forth Compiler for the Sharp Pocket PC-E500. Release of iziBasic version 6.1, the Basic compiler for Palm which is conveniently used from the Palm itself to develop while on the move. Release of ViziBasic version 2.1, the add-on application to iziBasic which is made to design Palm applications' visual user interfaces. A new version for all my applications developped with iziBasic will be made available in the coming days. If you cannot wait, you may download the iziBasic package which includes the updates for all applications that I release with open source code. With this iziBasic upgrade, now all my Palm applications run smoothly in the StyleTap platform for Windows Pocket PC. The results is really amazing and can be seen (with printscreens) in the aldweb Palm applications on a Pocket PC page.